Fox Valley Trout Unlimited invites you to Habitat Improvements of the Central Sands Region. 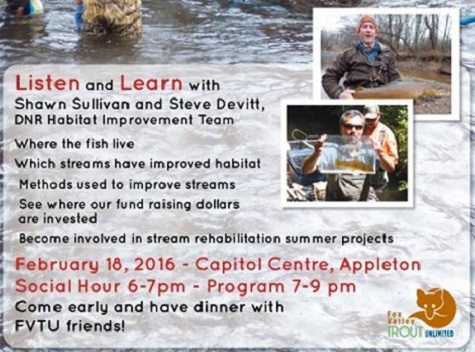 Listen and Learn with Shawn Sullivan and Steve Devitt, DNR Habitat Improvement Team. Which streams have improved habitat. Methods use to improve streams. See where our fund raising dollars are invested. Become involved in stream rehabilitation summer projects. Social Hour 6-7PM – Program 7-9PM. Come early and have dinner with FVTU friends!